My name is Paul Fletcher and I'm a long-term backpacker from the UK, I wanted to share some real-world advice on getting vaccinated, staying healthy and understanding the main illnesses that backpackers need to be aware of. I found that most of the websites that offered this kind of info were either too detailed, longwinded or too PC to say anything meaningful. I hope you find the site to be useful. Planning ahead is especially important when organising your travel vaccinations; why? because the most cost-effective means of getting vaccinated is to get as much as possible for free from your Government healthcare system (the NHS in the UK) and follow-up with a visit to a commercial Travel Clinic for the remaining (i.e paid) jabs. If this is your first visit to a developing country/region, I'd suggest starting the process of getting inoculated ~2 months ahead of your departure date as you'll likely need multiple visits to your local doctor / Travel Clinic to get a full set of jabs. Rookie travellers will require around 6-8 injections in total, its hard to give an exact figure as some vaccines are multi-part (requiring an initial & then booster jabs) and there are some multiple vaccines, e.g. a single jab is usually administered to cover the trio of: Diphtheria, Tetanus & Polio. The staff at your local surgery/clinic will tell you definitively what you need to have, based on the countries you are visiting and to some extent where you are staying, e.g. city/rural etc. there is an overview with more information here. I'd advise you to make your surgery/clinic appointment(s) in the afternoon or evening, as it's not uncommon to feel a bit rough after a vaccination, hardly surprising since the term 'vaccine' effectively means that a low-level derivative of the parasite / virus is injected into your body to stimulate your own immune system - the hard way. The injection(s) themselves are given in the shoulder and if you are receiving multiple jabs in a single sitting, both shoulders are used. Some vaccines are administered just below skin level (subcutaneously) and are pretty-much painless; others go deeper into the muscle and will sting a little - but it's nothing you can't handle. 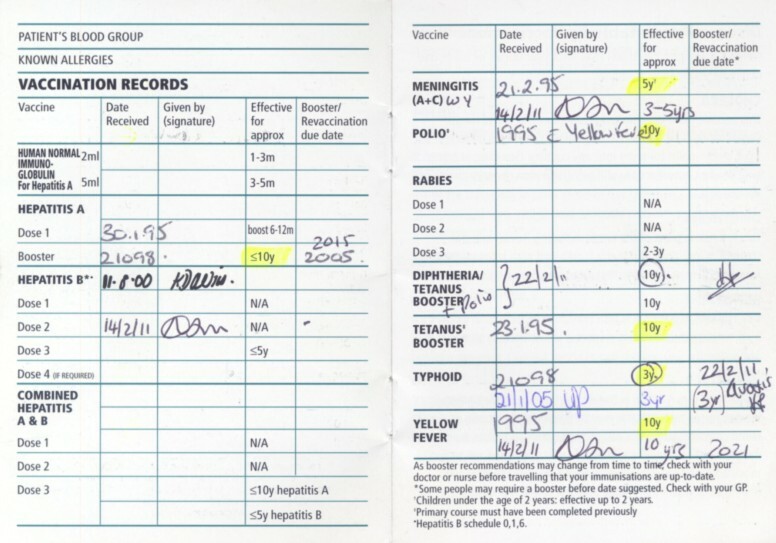 Make sure you get a vaccinations record card (below) when you start your series of vaccinations, the card shows which jabs you've had and their longevity, keep hold of the record card to avoid having to get repeat jabs unnecessarily when prepping for future trips - it's very easy to lose track of what you've had. You will see from my record card that I didn't get the Rabies vaccine - a judgement call based on some online research, but I was covered for everything else - don't leave home without having had a full set of jabs for the region you're headed to. Next: An overview of recommended vaccinations for Backpackers / Independent Travellers.